Welcome to our Nintendo Switch Super Smash Bros Ultimate New Characters Guide, below we have listed off every new fighter in SSBU (Echo Fighters Included). 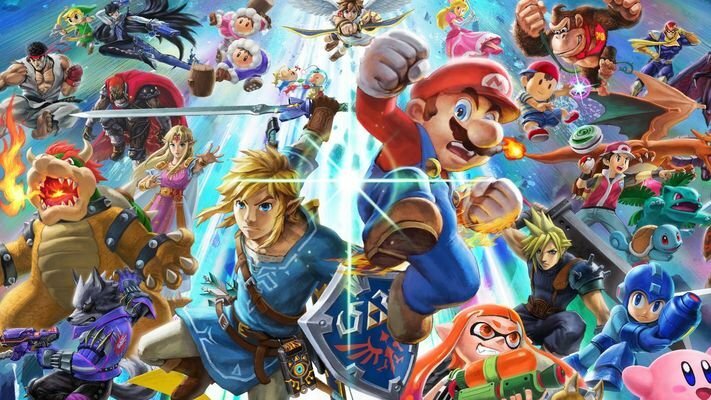 The Nintendo Switch Super Smash Bros Ultimate NEW Characters Guide, here we have listed all the New Fighters joining SSBU franchise. We have included which game series they are from (Universe) and a little description about each character from the Super Smash Blog. Piranha Plant Mario 1st DLC Character to be released. Chrom Fire Emblem The protagonist of Fire Emblem Awakening. Daisy Mario This princess has her own unique personality. She’s known for being upbeat, energetic, and a bit of a tomboy. Dark Samus Metroid With floatier movement, she’s a little different from Samus–and she doesn’t roll when dodging or jumping. Ken Street Fighter Hadoken is shaped differently, his strong Shoryuken has flames, and he moves a bit faster. King K. Rool Donkey Kong With long-distance special moves like the Blunderbuss, and counter moves like Stomach Attack, he is a versatile fighter. Incineroar Pokémon Newest Playable Pokemon Character joining the SSBU game. Inkling Splatoon Attacks with a variety of weapons. Covering opponents with ink leads to more and more damage. Isabelle Animal Crossing She uses various trinkets from around the village to battle. Her side special, Fishing Rod, not only allows her to snag and bring opponents closer, it can also be used as a recovery move. Richter Castlevania His basic attacks are the same as Simon’s, but with subtle variations. Ridley Metroid Ridley’s long tail and sharp claws let him unleash a torrent of devastating attacks. His Final Smash is a powerful stream of plasma breath intense enough to bring down Samus’s starship. Simon Castlevania The protagonist of Castlevania. He uses his holy whip, Vampire Killer, to perform a smash attack with long reach. He also uses projectiles like an axe, holy water, and cross. Want to View all the other NEW content in SSBU? Tap any of the links below to view other content in the game. That’s it? well no there is still the unlockable characters and how to get them, we made an entirely different guide dedicated to it.